Professor Andy Miah, BA, MPhil, PhD, FRSA is Chair in Ethics and Emerging Technologies in the School of Media, Language and Music at the University of the West of Scotland, a Fellow at FACT (Foundation for Art and Creative Technology), and a Fellow of the Institute for Ethics and Emerging Technologies, USA. He has a PhD in Bioethics & Cultural Studies and a Master degree in Medical Law. 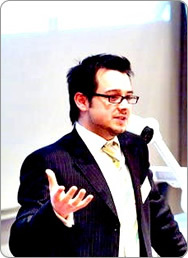 He is author of ‘Genetically Modified Athletes’ (2004 Routledge) and co-author with Dr Emma Rich of ‘The Medicalization of Cyberspace’ (2008, Routledge). Dr Miah’s research discusses the intersections of art, ethics, technology and culture and he has published broadly in areas of emerging technologies, particularly related to human enhancement. In 2002, he was an International Visiting Scholar at The Hastings Center (New York) with which he continues to collaborate. He has published over 90 academic articles in refereed journals, books, magazines, and national media press on the subjects of cyberculture, medicine, technology, and the Olympic Movement. He has also given over 100 major conference presentations and he is often invited to speak about philosophical and ethical issues concerning technology in society. Dr Miah is a member of various academic associations and working groups, including the Royal Institution of Great Britain, Yale University Bioethics working group, the Society of Applied Philosophy, and the Media, Communications and Cultural Studies Association. He is Associate Editor for the refereed journal Studies in Ethics, Law & Technology and Editorial Board member for two other international, refereed journals related to science and technology, ‘Genomics, Society and Policy’ and ‘Health Care Analysis’. Dr Miah regularly interviews for a range of major media companies, which have included BBC’s Newsnight, Vogue Magazine and various broadsheets. His publications have been translated into French, Dutch, Portuguese, Spanish, Arabic, Chinese, Russian and Japanese. Dr Miah has lived in Liverpool since May 2006, previously in Glasgow and Barcelona.